Max Everson was talking about the injury that, at first glance, appeared to have cost him his senior season. “You want to see pictures of it?” he said. 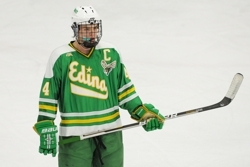 The Edina senior defenseman whipped out his cell phone and punched up photos of his left arm. The pictures, taken by Everson’s mother in a hospital examination room, show a huge bump near his wrist. What was initially thought to be a broken arm – the bone seemingly on the verge of breaking through the discolored skin – proved to be a dislocated wrist. “It was nasty looking,” Everson said. Everson said he did suffer a broken bone in his wrist -- his arm remains in a custom Hornets’ green cast – but that doctors have told him he is on pace to play again this season. Everson’s return from the injury he suffered in the closing seconds of a 4-2 win over Minnetonka on Feb. 10 nudges the balance of power in Class 2A back toward the Hornets. "It was ugly back then," Edina coach Curt Giles said. "But things are looking a lot better now. "I thought it was broken when we first saw it. I thought it was a compound fracture." Edina is the defending state big-school champions and, with Everson set to make his comeback in the Section 2AA semifinals (should heavily favored Edina beat Bloomington Kennedy as expected in the quarterfinals), the Hornets’ hopes for a repeat are significantly improved. Edina (15-7-2) took the No. 6 spot in the final state Class 2A rankings. No team in the top 10 has more losses, but then no team has a defenseman of the caliber of Everson. The Mr. Hockey finalist turned down a scholarship offer from the University of Minnesota, among other top Division I programs, to commit to Harvard. “They’ve got a great team, even without Max,” Eden Prairie defenseman Dan Molenaar said. In the final Class 1A rankings, St. Thomas Academy remained in the No. 1 spot it has occupied for most of the season. Hermantown is ranked No. 2 and Rochester Lourdes climbed to No. 3. Victoria-based team has won nine consecutive games after Thursday’s 3-0 victory at Lakeville North. The Pioneers enter the playoffs riding a 13-game winning streak, the longest in the state. A regular-season ending 4-2 triumph over Class 1A No. 1 St. Thomas Academy give Hill-Murray another quality win in a Classic Suburban Conference schedule the Pioneers mostly tore through as if it was paper mache. Ben Bahe (27 goals) tops a lineup loaded with talented goal scorers -- eight Pioneers have reached double digits in goals this season. No team should be more pepared for the rigors of the playoffs than the Eagles, who not only won the Lake Conference championship but played every top team in the rugged Classic Suburban Conference (Bloomington Jefferson, Apple Valley, Burnsville and Eagan) as well as northeastern power Duluth East, northwestern power Moorhead, private school power Benilde-St. Margaret's, northwestern suburban champ Maple Grove and east suburban juggernaut Hill-Murray. The Trojans' playoff fate could depend heavily on the play of its second line of Paule Voelker, Bryan Tabery and Sam Majka, a unit that has been scoring with regularity during the last month. That production has taken the heat off the uber-talented top line of Tony Cameranesi (15 goals, 39 assists), Mario Lucia (25 goals, 22 assists) and Tyler Klein (15 goals, 21 assists). Defensemen D.J. Jones (5 goals, 24 assists) and Marc Richards (9 goals, 17 assists) are supremely skilled with the puck. The Crimson went unbeaten in their final 15 games, with the only "blemish" being a 1-1 overtime tie with Centennial on Feb. 5. Senior goaltender Ryan Coyne finished the season ranked in the top 10 in the state in goals-against average (1.61, sixth) and save percentage (.925, 10th). He benefits from playing in front of one of the toughest defenses in the state, a group led by senior workhorse Steven Popowitz (4 goals, 11 assists). The Red Knights suffered a serious blow to their playoff hopes in the form of a knee injury to forward Pat Steinhauser in the regular season finale against Stillwater. The senior is the leading scorer (23 goals, 29 assists) and inspirational leader on a team filled with offensive standouts. If need be, B-SM can lean on superb sophomore Grant Besse (29 goals, 19 assists) to shoulder more of the scoring load. Don't let the Hornets' seven losses fool you -- the defending state Class 2A champions will be a force in the playoffs. They went toe-to-toe with Eden Prairie in the regular season finale, losing 5-4 on a goal in the final two minutes. 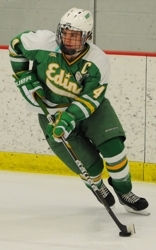 Edina played that game without senior Max Everson, one of the state's top defensemen. Everson is expected to be back in the lineup for the Section 3AA semifinals. The Greyhounds finished the season with a bang, thumping Hastings 12-2 and Tartan 6-0 to enter the playoffs on high. Also included in Duluth East's late-season tear was an impressive 8-1 rout of rival Cloquet on Feb. 8. They Greyhounds don't have a lot of scoring depth beyond the superb top line of Trevor Olson (20 goals, 35 assists), Jake Randolph (25 goals, 27 assists) and Dom Toninato (24 goals, 26 assists). The Skippers enter the playoffs on a late-February swoon, as they won just one of their last five games. Minnetonka appeared to be in position to win the talent-laden Lake Conference but late losses to Edina and Wayzata (by identical 4-2 scores) and tie to Eden Prairie knocked them out of championship contention. Sophomore Vinni Lettieiri finished the regular season with a team-best 37 points while junior Erik Baskin was the goal-scoring leader with 20. The Blaze have feature two lines that can score with consistency, a shutdown defenseman in Sean Madigan and big-game goaltender in Upper Midwest High School Elite League alum Bodhi Engum. They also can boast a resume win over No. 1 Hill-Murray (granted it was in the season opener). The Wildcats were cruising along toward the playoffs, riding an eight-game unbeaten streak before suffering a season-ending 3-2 loss to surging Bloomington Jefferson on Jan. 19. Juniors Michael Zajac and Will Merchant, who have combined for 51 goals, form one of the state's most lethal scoring tandems. Honorable mention: Apple Valley, Grand Rapids, Bemidji. The forward trio of Zach Schroeder (23 goals, 29 assists), A.J. Reid (19 goals, 29 assists) and Matt Kroska (23 goals, 20 assists) is as formidable as any in state. Dynamic senior defenseman Taylor Fleming is (6 goals, 26 assists) helps fuel the Cadets' potent offense. David Zevnik (.904 save percentage, 2.04 goals-against average) will get his first taste of playoff pressure. Senior Garrett Skrbich tied for fifth in the state with 37 goals and is a superb all-around player and locker room leader. Junior Jared Thomas, with 24 goals and 29 assists, is well on his way to following Skrbich and, before that Adam Krause, in becoming the next great Hawks' forward. Return of high-scoring junior Andrew Mattson, a first-line forward, should bolster chances of reaching state tournament. The Eagles should be finely tuned for the postseason, as they finished the regular season with a 3-3 tie against No. 6 Totino-Grace. Rochester Lourdes played three other top-10 ranked Class 1A teams en route to posting one of the state's best regular season records. High-end forwards Jason Samuelson (21 goals, 14 assists), Alex Funk (12 goals, 19 assists) and Landon Farrell (15 goals, 16 assists) provide the bulk of the scoring. Nick Heimer has played every minute of every game for the Eagles, posting a 1.85 goals-against average and .914 save percentage. It took the Mustangs some time, but they finally got their signature win in their final game of the regular season, a 5-1 thumping of Tri-Metro Conference and Section 4A rival Blake on Feb. 19. Connor Anderle (19 goals, 39 assists) finished the regular season as the team's points leader, and Wesley Iverson (26 goals) and Grant Opperman (24 goals) were the leaders in goals. Jack Kenney (2.30 goals-against average, .907 save percentage) got the start against Blake and could be the go-to goaltender in the playoffs. Blake had its nine-game win streak snapped in its season-ending loss to Breck. The Bears' power play is humming along at a 36-percent efficiency rate, thanks largely to the the work of forwards George Ordway (22 goals, 31 assists) and Donald Chute (20 goals, 22 assists) and defenseman Ryan Bullock (12 goals, 18 assists). The Eagles went winless in their final two regular season games, but the games were against quality opposition (a 6-1 loss to No. 5 (Class 2A) Benilde-St. Margaret's and 3-3 tie against No. 3 (Class 1A) Rochester Lourdes). T.J. Roo finished the regular season as the team's points leader with 54, while Xavier Fust had a team-best 25 goals. Senior defenseman Carson Gray (6 goals, 22 assists) shares the team scoring lead with power forward Nick Stoskopf (13 goals, 15 assists). Senior David Nelson emerged as the go-to goal scorer with 17, but this is a team that relies on a suffocating defensive play and the granite wall goaltending of Andy Foster (2.01 goals-against average, .911 save percentage). The Blue Devils closed out the regular season with wins over Duluth Marshall and Hibbing, a good omen given that both teams are Section 7A rivals. Senior forward Garrett Hendrickson, a St. Cloud State recruit, finished in tie for sixth in the state in scoringwith 72 points, including 45 assists (fourth in the state). The Flyers won eight straight to close out the regular season. Junior Joey Hanowski has a 10-game goal-scoring streak entering the playoffs. He scored a team-best 30 goals in the regular season. Goaltender Michael Stumpf finished third in the state in save percentage (.935) and fourth in goals-against average (1.50). The Hilltoppers lost three of four to close out the regular season, but their body of work during the regular season includes wins over No. 1 section seeds Warroad (8A) and Rochester Lourdes (1A). Judd Peterson's 24 goals and 43 points are team highs. Honorable mention: Hibbing/Chisholm, South St. Paul, Delano, Mahtomedi.